Forget Your Resume and Take Control of Your Future! 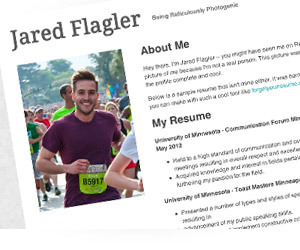 Forget Your Resume - Instead, Use an Awesome Online Presence to Impress Potential Employers. Still using just a simple paper resume? This puts you at a huge disadvantage against the thousands of other applicants who have a great online presence. Get the advantage of an online presence with this simple open source tool. We've made it so easy, you can have your own online resume up and running in less than 10 minutes. Are any of your friends looking for a job? Be a good friend and share this website with them! Point and Click Design - Customize your online presence to match your unique style. Millions of potential combinations. Create Custom Messages - Sending custom messages to potential employers has never been easier. Your paper resume can't do that, can it? Responsive Design - Looks great on mobile devices, tables, and desktops. Easy Install - Use one of the hosts that has 1-click install or install it on your own host in minutes. Complete WYSIWYG integration - You can even copy and paste your resume straight from Word. Complete Social Media Integration - Show off your social profiles and connect them to your LinkedIn account. If you have hosting, great skip this step, if not. We recommend you sign up with GreenGeeks because they offer, a much requested, 1-click install. Sign up with coupon code "forgetyourresume" to get $30 off. Once you've got your hosting figured out, download the software by clicking here or visiting our github page. Once you've got the software downloaded, simply unzip it and upload the files to your root directory. Once you've done that simply visit yourdomain.com/settings. (the default username is "admin" and the default password is "admin"). If you run into any snags or want a video walkthrough venture over to our Download and Install page for a more detailed guide.